Looking for a Unique Christmas Experience in Portland? My family always enjoys our Christmas traditions, but each year it is fun to spice things up and try something new. Several years ago a friend invited us to Tuba Christmas. Tuba Christmas, I didn't even know such a concert existed! Well, it does, and each year it grows in size. When we first attended the celebration, 200 musicians participated, now the orchestra has increased to include 300 tubas! Located at Pioneer Courthouse Square, I would advise you take the TriMet Max and arrive early. It gets crowded! If you are familiar with the Pioneer Courthouse Square, you know there is a Starbucks on site, but because of the number of attendees, the shop is jammed with people. I'd suggest walking to several other fantastic coffee shops nearby like Public Domain, Barista, Peet's Coffee, or Moonstruck Chocolate which not only serves great coffee but gives free chocolate samples. If you have intolerance issues and don't mind a walk, stop by Petunia's Pies and Pastries for delicious vegan and gluten-free options. 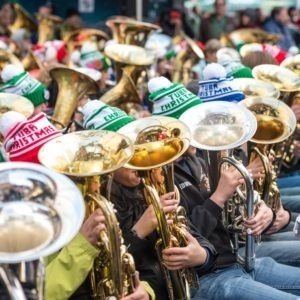 So if you want to start your holiday celebrations early, set aside Saturday, December 8th from 1:30-3pm for the 28th Annual Tuba Christmas. Or better yet, pull out your own tuba, and register online to join in the fun. However you celebrate Christ's birth this year, may your home be filled with the hope and peace only He can give.